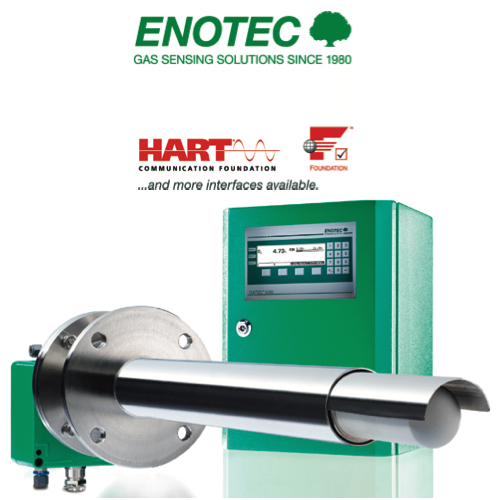 02 is desirable and also attainable with ENOTEC systems. Oxygen values below 0.5% 02 are an indicator of an incomplete combustion which produces an increase in unburned molecules. The OX/TEC 5000 InSitu analyzer system has been proven in countless installations, in all possible combustion systems, using all possible fuel types, usually with more than 10 years lifespan in most flue gas applications. The system comprises a robust probe which is inserted directly in the process for fastest and most representative measurement (the sensor is located at the tip of the probe directly in the process). The modern and highly intelligent electronic unit has a graphics enabled, bright LED backlit display for easy handling. OX/TEC 5000 has no need for calibration and thus provides maintenance-free 02 analysis, typically for many years.